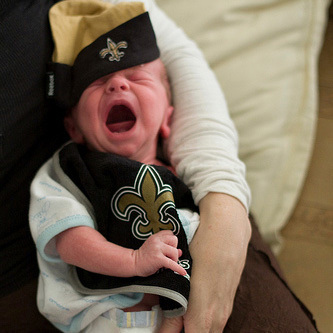 Dot-Com Discrimination & The New Orleans Saints? Brian Allee-Walsh covers the New Orleans Saints for the news website NewOrleans.com. Allee-Walsh wrote for the local daily paper, The Times-Picayune, for over 32 years, covering the Saints for the last 23. This past November, Allee-Walsh reported that he was suddenly banned from covering the team’s practices since he was a dot-com reporter. NewOrleans.com had been fully credentialed for Saints coverage since the site launch a little over a year-and-a-half-ago and is fully credentialed by other local sports teams. He was still able to cover the team’s news conferences, locker room, and games until a complete banishment came in December. It was not just Allee-Walsh, however; reporters from CBSsports.com and WWL-TV.com as well as other NewOrleans.com writers were also banned. Those two sites were added to the ban only after Allee-Walsh questioned why he was singled out, however. Saints spokesman Greg Bensel said in response, “We are just in the process of examining our policy on ‘dot coms’ as they pertain to viewing practice. We are trying to fall in line with what the majority of the league is doing relative to ‘dot coms’ not affiliated with the team or league.” CBSsports.com, one of the banned media outlets, reported that only four of the 32 teams had banned them. Les East, a colleague at NewOrleans.com, reported that Allee-Walsh was once again banned from reporting on the Saints a few days ago during their media availabilities leading up to Sunday’s Super Bowl game. His article suggests that coverage Allee-Walsh provided on two specific players, Reggie Bush and Jeremy Shockey, could be the real reason behind the ban. NewOrleans.com has tried to address the problem through the Pro Football Writers of America, of which Allee-Walsh is a longtime member, and through the National Football League (NFL). […W]e’re not so sure there is a good reason for the Saints’ actions because they haven’t provided one. They say their policy is to deny access to web sites, but other web sites have access. They say only web sites affiliated with the NFL are allowed to cover practice, yet representatives of NOLA.com are allowed to cover practice daily. They have singled out one individual to place one web site at a distinct competitive disadvantage without offering any explanation that holds water. We think that’s unfair and discriminatory. Allee-Walsh will continue to report on the Saints now that they’re in Miami and are gearing up for Sunday’s game. The NFL handles media credentials for the Super Bowl, not the individual teams. Since the NFL also handles credentials for the playoff games, Allee-Walsh was able to cover those as well. Image by storyvillegirl on Flickr, used under its Creative Commons license.